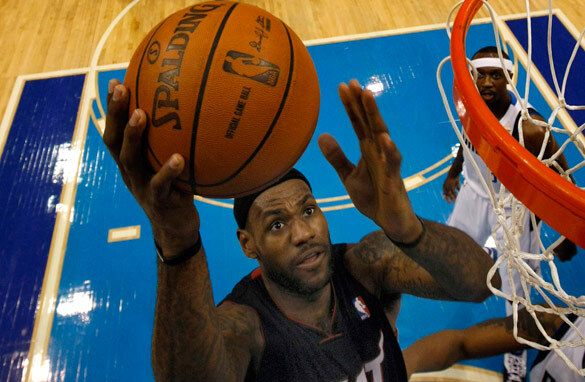 Lebron James incurred the wrath of Cleveland Cavaliers fans with his move to Miami Heat earlier this year. When Lebron James takes the court against the Cavaliers this week for his first game in Cleveland since his off-season move to the Miami Heat, he’ll likely face a level of abuse not seen in the NBA for decades. His abdication as king of the Cavs was nothing short of treason as far as many Cleveland fans were concerned, and his departure, without delivering the championship he’d promised, was viewed as the ultimate act of desertion. Of course, he’s not the first sportsman who’s become an instant pariah by moving to another club. In 2000, Luis Figo’s transfer to Real Madrid from Barcelona caused so much acrimony that the Portuguese footballer reportedly received death threats and had a severed pigs head thrown at him when he returned with Madrid to the Camp Nou for the "El Clasico" clash between the Spanish rivals. Meanwhile, former England defender Sol Campbell is still referred to as “Judas” by Tottenham fans, nine years after he did the unthinkable by joining Spurs’ north London rivals Arsenal. In turn, Gunners fans have similar feelings toward one of their former heroes following Ashley Cole’s crosstown move to Chelsea in 2006. In baseball, Texas Rangers fans often target their former golden boy Alex Rodriguez, who quit his record-setting 10-year, $252 million deal in 2004 to join the New York Yankees. Later, he said he regretted ever signing with the Rangers and only joined them for the money. In the NFL, many Packers fans don’t have a good word to say about record-setting quarterback Brett Favre, even though he starred with Green Bay for 16 seasons and led them to two Super Bowls, winning one in 1997. The reason they feel this way stems from his protracted retirement saga back in 2008, which ended with him tearfully hanging up his cleats only to return a couple of months later with the New York Jets. Favre subsequently joined the Packers’ arch-rivals, the Minnesota Vikings. So, Lebron’s in good or bad company, depending on whether you see his move as a courageous decision to seek greener pastures or a mercenary act of cowardice. Either way, he belongs to Miami Heat, and you can bet that his detractors will be the ones screaming loudest when he first runs the gauntlet in Cleveland on Thursday night.